I just couldn't resist the urge to make a trip onto the Boots website the other day and make some purchases. Some of the things in my haul were necessities, however, there are some products that I wanted to treat myself to, and also a couple of freebies! First, onto the necessities. Back in the summer I purchased the Origins Gin Zing moisturiser as part of a gift set which also included eye cream and mascara. Well, my moisturiser has run out and I needed to keep that moisturiser in my life. It's perfect, not greasy and just sinks straight into your skin. I also needed some more of the Maybelline 'The Falsies' mascara. This is another product of which I always sing its praises. I've tried many mascara's over the years and none of them compare to 'The Falsies'. It's the only mascara that I've ever used that lifts my lashes and gives them definition and volume. I think it's mostly due to the fact that the wand is curved so it can get right into the base of your lashes. Another necessity is the Rimmel Stay Matte powder. I've been running low on the for while, not helped by the fact the powder actually smashed to pieces (oops! ), probably caused by me banging my makeup brush against the side of it, so I lost majority of the powder. I've learned my lesson now not to do that! Finally, I also needed to restock up my Collection Lasting Perfection concealer. I go through concealer so quickly! Now it's onto the products that I just needed to treat myself to! The first one is the Benefit Brow Zings brow kit. When it comes to my brows I just used to use a brown eyeshadow that I got in a makeup pallet and a Maybelline brow mascara. However, I've wanted to purchase a brow kit for a while and looked at lots of different ones, but I love Benefit's products and this was the kit that stood out the most to me. I also wanted to try the Origins Charcoal Mask, mainly because my skin is so prone to imperfections and blemishes that it seemed that this was a product that would help with my problem skin. While on the subject of my skin, I also got the Soap and Glory Make Yourself Youthful rejuvenating serum. This was mainly in the hope that it would banish my tired looking skin! It's an energy boost for your face which hopefully work some wonders. I also received some freebies in the parcel thanks to purchasing certain products. 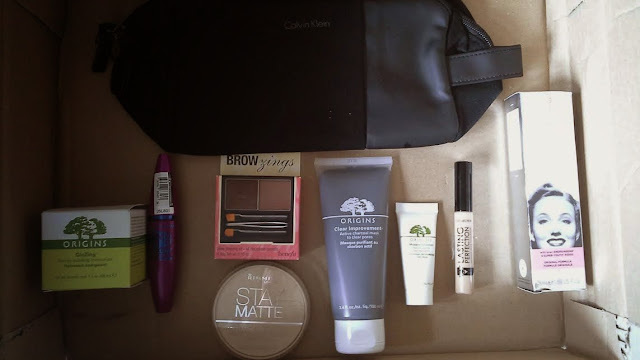 The first one is a Calvin Klein wash bag which will come in very handy. I received this having bought the new Calvin Klein fragrance, Reveal (review coming soon!). As I will be writing a review on Reveal, I've decided not to feature the product on this post, keep your eyes pealed for the review! Another freebie I received was a mini sample of the Origins Modern Friction. Having bought two Origins products, I was eligible to receive this product. Modern Friction is a scrub, however, it's a softer scrub without the sandpaper like feeling. It contains lemon oil which smells amazing! 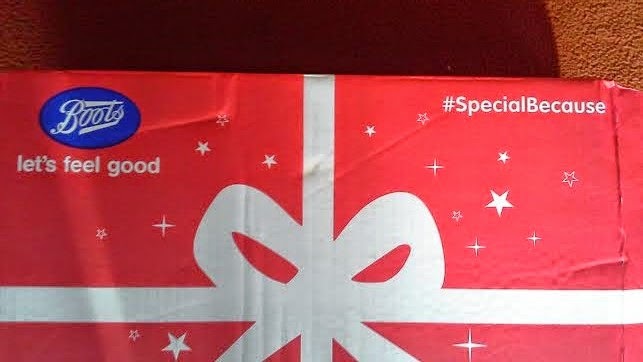 One last thing I'd like to point out, is how festive the Boots parcels are! So that was my Boots Haul. I hope you enjoyed this post, remember to leave me a comment below!